The South African government has criticised the UK after it announced it would stop direct aid in 2015. UK ministers said their relationship with South Africa should now be based on trade and not development. But South Africa said it had not been properly consulted over the move and it would have "far-reaching implications". The aid programme, currently worth £19m a year, is focused on reducing the mortality rate among women giving birth and supporting businesses. At its peak in 2003, the UK's aid for South Africa was more than £40m. 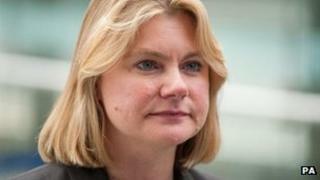 International Development Secretary Justine Greening made the announcement at a conference of African ministers and business leaders in London on Tuesday. "South Africa has made enormous progress over the past two decades, to the extent that it is now the region's economic powerhouse and Britain's biggest trading partner in Africa," she said. "We are proud of the work the UK has done in partnership with the South African government, helping the country's transition from apartheid to a flourishing, growing democracy. "I have agreed with my South African counterparts that South Africa is now in a position to fund its own development. "It is right that our relationship changes to one of mutual co-operation and trade, one that is focused on delivering benefits for the people of Britain and South Africa as well as for Africa as a whole." But South Africa said there had been no "proper consultations" about the move. "This is such a major decision with far-reaching implications... and it is tantamount to redefining our relationship," the Department of International Relations and Co-operation said in a statement. "The UK government should have informed the government of South Africa through official diplomatic channels of their intentions." In response, UK officials said they had had "months of discussions" and "many meetings" with their South African counterparts prior to the decision. Labour said ministers had taken the "wrong decision" and that the South African authorities had "contradicted" Ms Greening's version of events. Shadow international development secretary Ivan Lewis said it was important to maintain financial help to "middle income" countries like South Africa, which he described as "strategically" very important. "This looks like a serious breach of trust with one of our most important strategic partners. Justine Greening must explain why she is saying one thing about her conduct while the South African government is saying another," Labour said in a statement. "Behaving in what looks like a high-handed and patronising fashion towards South Africa is no way to treat one of the world's key emerging nations and is not in Britain's national interest." Video Where does the UK's aid money go?